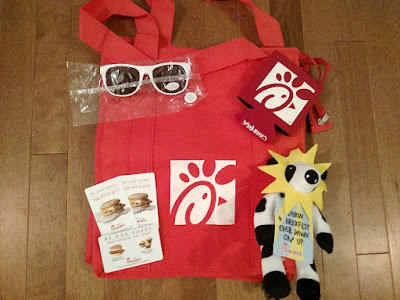 Have I mentioned before that I'm a Chick-fil-A Mom? That means I get to learn about things that are being released and give input into the things CFA does! Not a bad gig, eh? Just a heads up, they've got their Peppermint Chocolate Chip Milkshakes and Chicken Tortilla Soup back for the season. If you haven't tried either...you need to get there and have them both! Maybe not at the same time. lol They're only here for a limited time, so get a move on it. Did you know I work from home? I do. I get up every day and work from my couch. Might sound wonderful, but that means I never get out during the day unless I'm taking a kid to a dr appt or something along those lines. The hardest part of working from home is the lack of interaction with people. The other part of me working from home is that I never pass a Chick-fil-A on my way to work. It would have to be in my entry way, and sadly, there's not one there. Going from my bedroom to my living room means I don't get out in the morning. My closest CFA is about 25 minutes from me. I'll explain to you how this works to YOUR benefit in just a sec. Every fall, CFA picks a large group of bloggers to be part of a panel. The last couple of years I've been blessed to be part of those panels. They always send out a little goody bag to their panelist, and it's something we look forward to. I forget about it each time, but when it shows up, we're all like, "woo hoo look at what came!" A week or so ago, I received my welcome package for being part of the panel again this year. THIS is where this works to your benefit. 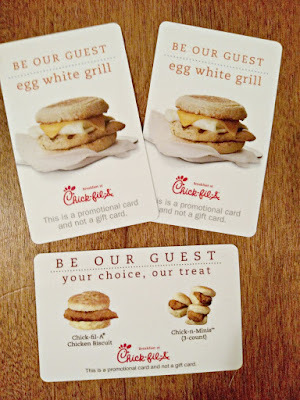 They sent a few gift cards for breakfast items. Can you believe I've never had one? I'm never out that early. I don't go anywhere in the morning. That doesn't mean you shouldn't be able to try their breakfast items and enjoy them, right? Bacon-Egg-Cheese-Biscuit looks so good love to try one! I love the Chicken Minis!! Chicken, Egg & Cheese on Sunflower Multigrain Bagel looks very delicious right now! Hmmm the chicken biscuit is yummy but have you had their coffee? I love it! I like the plain Chicken Biscuit. It is so good. The chicken biscuit and the yoghurt parfait. I have fallen in love with the new Egg White Grill. I was afraid that it would be bland, but it's so juicy and flavorful! Even my little ones like it! I am so super hungry for their Bacon, Egg & Cheese Biscuit!! I'd like to try the Sausage, Egg, and Cheese Biscuit. I like the egg white grill. I am hungry for the Bacon, Egg & Cheese Biscuit! Thanks for a great giveaway! I am wanting their Bacon Egg and Cheese Biscuit! I mean I want it NOW! haha I hate looking at yummy food, it makes me so hungry. God bless and good luck everyone! I love the egg biscuit!! So many great options! I like their Greek Yogurt Parfait and would like to try their chicken biscuit. I'm hungry for a Chicken Biscuit. Bacon egg and cheese biscuit! I love the Chick n minis. Thanks for the chance to win. You can't go wrong with a bacon, egg & cheese biscuit. It's been a while since I've been there. Chicken egg and cheese biscuit!!! But the bagel looks tempting. I am hungry for the "Chicken, Egg & Cheese on Sunflower Multigrain Bagel". I am hungry for their Sausage Egg and Cheese Biscuit! The minis are my favorite! I'd like the Egg White Grill. Looks yummy! I want to try the breakfast burrito. I would like one of their Bacon, Egg & Cheese Biscuits right now. Maybe some of the tater-tots on the side too. The breakfast burrito looks great! The breakfast bagels are soooo yummy! I could eat them for lunch too, haha. I would LOVE to try their Bacon Egg and Cheese Biscuit! You cannot go wrong with that combo! I LOVE THE CHICKEN BSICUIT! Their Spicy Chicken Biscuit is my favorite. So tasty!